An interesting new Grip UI (grip user interface) was demonstrated last week at CEATEC, the Japanese computer show. 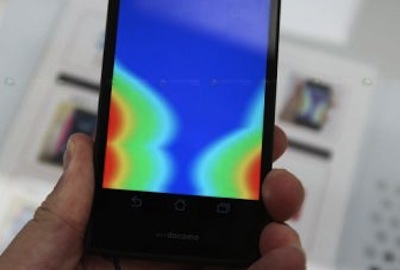 The idea is that a smartphone equipped with pressure sensors on the sides would have new and unique possibilities for users to select and navigate through their smartphones without having to obscure the screen with their fingers. The phone is fitted with a standard touch screen, but users can grip the device in certain places to launch programs, navigate menus, and perform other tasks. One of Docomo’s goals for Grip UI is to add ways for users to control cell phones with just one hand. With modern phones, single-handed navigation is still difficult in certain program. One handed, you’re generally limited to using your thumb for navigation and selection. The trend towards longer, wider phones actually makes this a bigger problem; larger devices make it more difficult to move your fingers while maintaining a grip on the unit. Adding pressure sensors to a device theoretically opens up new avenues for user control. Sensors that ran the length of the phone could be programmed to respond differently depending on where the device is gripped. Detecting pressure on both sides of the device could expand the number of different commands that could be programmed. "Sixty-three," he said. Congressman Brant lifted his eyebrows. "Is that right?"